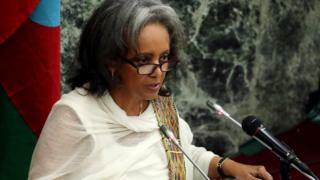 Ethiopian members of parliament have elected Sahle-Work Zewde as the country's first female president. Ms Sahle-Work is an experienced diplomat who has now become Africa's only female head of state. The new president was keen to make a point about gender equality right from the start, telling MPs that if they thought she was talking too much about women, she had only just begun. There may now be male-female parity in the new cabinet but elsewhere there is still a long way to go. Ms Sahle-Work's appointment has been welcomed by Ethiopians on social media with many calling it "historic". She has been described as Ethiopia's first female head of state of the modern era, with some remembering Empress Zewditu who governed the country in the early part of the 20th Century. The prime minister's chief of staff, Fitsum Arega, tweeted that "in a patriarchal society such as ours, the appointment of a female head of state not only sets the standard for the future but also normalises women as decision-makers in public life". President Sahle-Work has served as an ambassador for Ethiopia in Senegal and Djibouti. She has also held a number of UN positions, including head of peace-building in the Central African Republic (CAR). The last African female head of state was Mauritian President Ameenah Gurib-Fakim, who resigned in March over an expenses scandal. She denied any wrong doing.